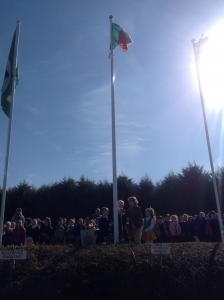 Today, we celebrated the 100th anniversary of the Easter Rising, the rebellion for Irish independence. For the past few weeks all pupils were busy learning about different aspects of the Rising so we had an assembly to show the community all of our efforts and raised our National Flag outside after. We had a number of special guests including Basil Burke representing the Historical Society alongside Monica Browne and Martina Foley. Other local people who were born in the decade or so after the Rising were invited also, one of those being Henry King who helped to raise the flag. 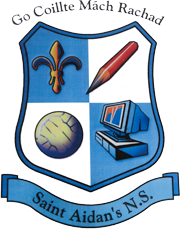 Our assembly began with the school choir singing the National Anthem and after this each class discussed their work on display. 6th Class completed a patch study based on the Easter Rising. Liam, Sara, Lucy and Francisca told us all about it. 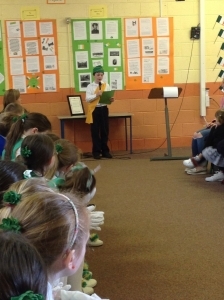 5th Class did projects documenting the key events of each day during that significant week in April 1916.  A number of children from the class synopsised those events. 4th Class did projects based on the key locations of the Easter Rising. Cormac told us more. 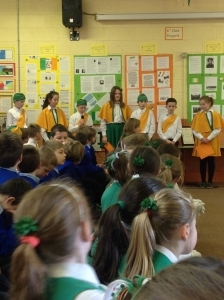 3rd Class researched our National Flag and some pupils told us facts about it. 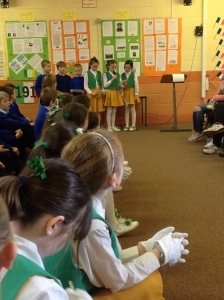 2nd Class learned more about the Tricolour. They learnt about how we show respect for the flag and care for it. 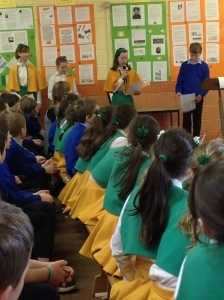 Clodagh, Róisín, Caoimhe, Alex, Daniel and Eryk outlined the main ways in which to do this. All lower classes completed artwork and displayed them on their class windows for all to see. 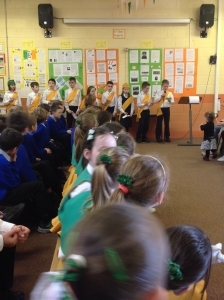 Moving outside, Banna Cheoil Scoil Aodáin played a tune to begin and ended with Amhrán na bhFiann. 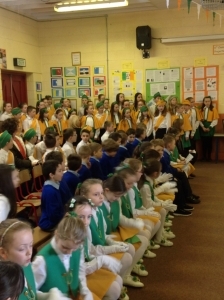 Finally, members of 6th Class read out their proclamation written by them in preparation for today. Please click here for more pictures from the day.